If there's one thing we take allllmost as seriously as the major details of a wedding, it's the cake table. The cake is one of the most important (and definitely the most delicious) wedding details, and we love to go all out on our cake displays! No matter what your wedding style is, we've got a backdrop and plenty of decor to make your cake table complete. Plus, our cake vendor, theCakePlace, makes the most beautiful cakes that are a work of art all on their own. There are so many great cake displays that our team has done that come to mind, but here are 10 that are exceptionally pretty! We'll neverrrr stop obsessing over the modern, geometric details of Jessica + Brett's wedding! From their gorgeous invitation suites to the modern cases and hanging geometric planners, this wedding had so many unique details. One of the most stunning details was their cake table. It included several cakes (this couple goes all out!) on pretty cake stands, cookies, and hanging planters full of stunning florals. Hands down, one of my favorite weddings ever! 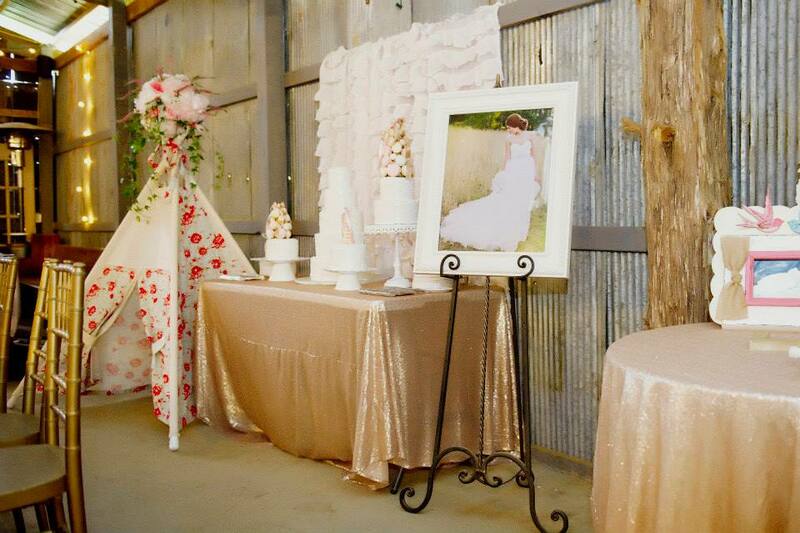 Oooh, I love this sweet, rustic chic cake table at Emily + Blake's wedding. Deer antlers were carried throughout this couple's decor, so the painting behind their cake couldn't have been any sweeter or more perfect. And that cake... Have you ever seen a more gorgeous naked cake?! Other details I loved from this wedding: lots of chambray, unique florals, and that insane book backdrop for their sweetheart table! Alyssa + Matt's wedding in one word: FUN! Their bold color palette was fun, their details were sweet and fun, and this couple... Yep, they were fun, too! Their cake table was one of the highlights: one pretty, simple white cake, other gorgeous, delicious desserts, a rustic wood backdrop, and bold blue linens and curtains. So much pretty! We looooved Amanda + Brad's intimate, pink, shabby chic elopement. The altar was stunning, and the flowers were super sweet. And one of the best details was... You guessed it, their cake table. :) Ruffles, vintage white doors, teacups full of flowers, the cutest little cake. We loved everything about this one! Mackenzie + Tyler's cake table was just as elegant and glamorous as the rest of their details! They used an antique table, topped with green garlands. Their gold frames and backdrop, (rustic wood with gold sequins) fit perfectly with the rest of their wedding decor. And the cake itself was absolutely stunning! When your cake is this stunning, it's definitely better to go simple on the decor. A rustic wood backdrop was all that was needed for Monica + Ryan's show-stopping cake! The rest of the details at this wedding were over-the-top gorgeous (see their florals, Monica's dress, the bridesmaids' dresses, the altar, etc.) so we weren't one bit surprised that the cake was jaw-droppingly pretty! I've talked about Katie + Alan's wedding officially WAY too many times. I just love it so. ;) Their cake was fabulous, so it didn't need a lot of details around it. But the ruffles and B monogram, plus one of Katie's framed bridal portraits, were perfect. If you haven't already seen this rustic-glam, whimsical wedding, you can't miss their flowers, altar or reception tables! Every detail from EmeryAnn + Andrew's bohemian wedding was unique and gorgeous, including their fun petal aisle, gorgeous altar set-up, crocheted doilies down the aisle, hanging florals above the reception tables, and their cake table. It was finished off with a quilt and vintage suitcases. And their naked cake was perfection! Ashley + Derrick's wedding was full of color and fun details! Their cake table was no different. Four colorful cakes on wood cake pedestals with a hot pink fringe backdrop. How fun! We haven't stopped obsessing over this wedding's flowers, especially the peonies and the bride's insaaaane bouquet! Am I the only one craving cake now?! ;) I hope y'all have a perfect spring weekend!